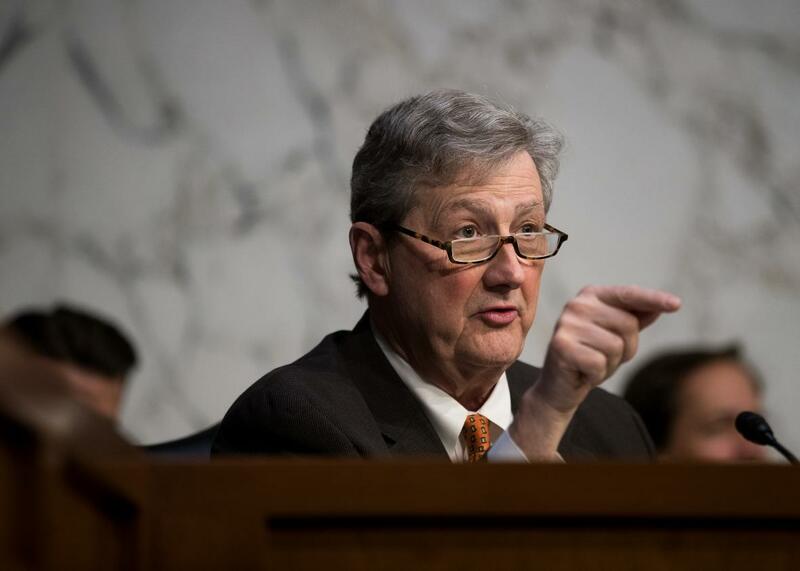 Republican Senator John Kennedy is rejecting Trump’s outrageous judicial nominees. President Donald Trump has the opportunity to reshape the federal judiciary by nominating more than 100 judges to lifetime appointments on the bench. With the help of the Federalist Society and the Heritage Foundation, Trump has mostly chosen hardline conservatives with respectable resumes who are objectively qualified if ideologically extreme. Several of his selections, however, are plainly unfit for the job, with disturbing fringe views and volatile temperaments. Republicans easily confirmed one such nominee in July over the unanimous opposition of Democrats. But it now appears that at least one GOP senator, John Kennedy of Louisiana, is drawing a line in the sand over Trump’s most egregious picks. Kennedy spent Tuesday and Wednesday establishing his discontent with several aspiring judges whom Trump has sent to the Senate for approval. First, on Tuesday, he voted against Gregory Katsas’ confirmation to the U.S. Court of Appeals for the District of Columbia Circuit. Remarkably, that made Kennedy the first Republican Senator to vote against one of Trump’s judicial nominees. Kennedy, who is a lawyer, explained that he opposed Katsas due to a “conflict of interest” that “a first-year law student would see”: In his current role as deputy White House counsel, Katsas worked on contentious executive orders, and helped to craft the president’s response to special counsel Robert Mueller. The senator then declared that he would vote against Brett Talley, whom Trump has nominated to the U.S. District Court for the Middle District of Alabama. Kennedy noted that Talley is married to the White House counsel’s chief of staff, a fact he failed to disclose to the Senate. He also pointed out that the 36-year-old Talley has little legal experience. “And he’s never tried a lawsuit in his natural life,” Kennedy complained. “And he’s gonna be on the federal bench? Give me a break. A break. It is embarrassing. And I think the president of the United States is getting some very, very bad advice.” He added that he’d vote against Talley “in a heartbeat—twice, if I can.” If two more Republican senators were to vote against Talley, his nomination would fail—presuming every Democrat votes against him, which appears likely. Of course, Stras and Duncan answered no to all three questions. But Kennedy wasn’t really directing these inquiries at them. He was making a point about Trump’s wackadoo nominees, putting the White House on notice that he will no longer tolerate fanatical kooks. Kennedy’s sudden resistance to blatantly unqualified judges is a bit tardy. He already voted for Talley, Katsas, and Schiff in committee; he also voted for John K. Bush, a similarly obnoxious anti-gay blogger, in committee and on the floor. (In committee, he criticized Bush’s blog posts—then voted for him anyway.) Still, Kennedy deserves credit for finally putting his foot down. Until Tuesday, no senator had dared to break with the White House on judicial nominees; with luck, Kennedy might free his independent-minded colleagues to vote their consciences. And no senator who respects the federal judiciary could possibly approve of men like Talley, Mateer, and Schiff.